To mark Singapore 53rd birthday, Chef Alex Siah of Conrad Singapore has collaborated with renowned and award-winning Singaporean Chef Shermay Lee. 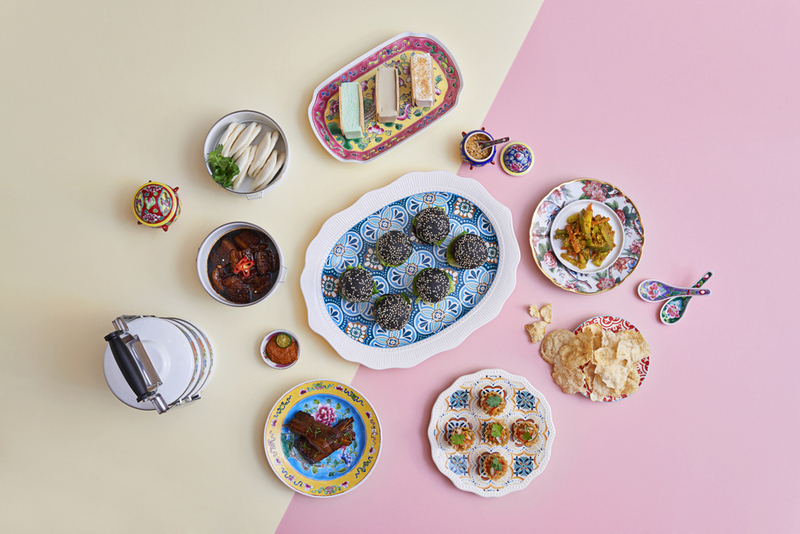 This collaboration will present three new signature Peranakan dishes which will be featured at Oscar’s buffet line from 3rd to 31st August 2018. I was fortunate enough to have a front-row seat to this gastronomic experience and also chat with Chef Alex, hail from traditional Peranakan family in Melaka and Chef Shermay the 6th generation of Peranakan in Singapore on their inspirations to these Peranakan dishes. These next three dishes are co-created by Chef Shermay and Chef Alex. 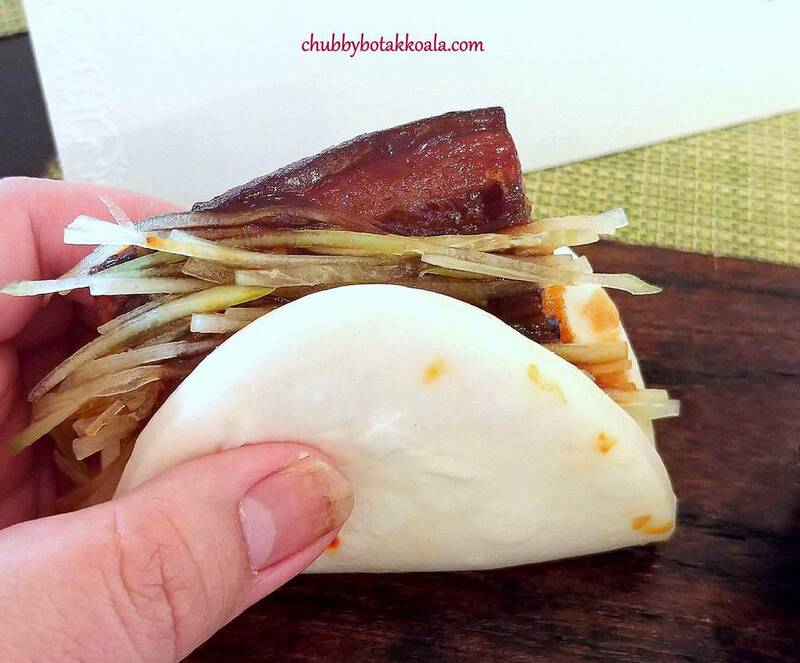 Pork Belly with Steamed Buns (Kong Bak Bao). Peranakan version of stewed pork belly. The pork belly is well marinated, slightly sweet and tender. Unlike some pork belly that is overcooked and fall apart, the version here maintain its shape nicely, has a nice bite to it and it is a perfect companion with the soft and fluffy lotus bun. Oink Oink!! 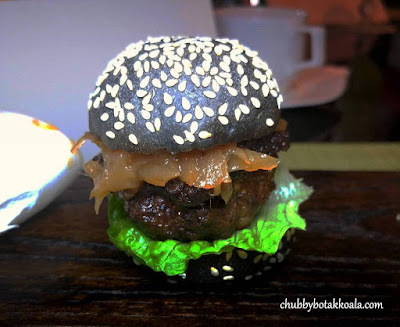 The Black Gold – A Buah Keluak Beef Burger. This dish is inspired by Chef Shermay fondness for Burger as one of her comfort food. Hoping that Buah Keluak Burger can be her next comfort food. In creating the beef patties, Chef Shermay uses her grandma’s Buak Keluak recipe (with the spices) and mixed it together with minced beef. 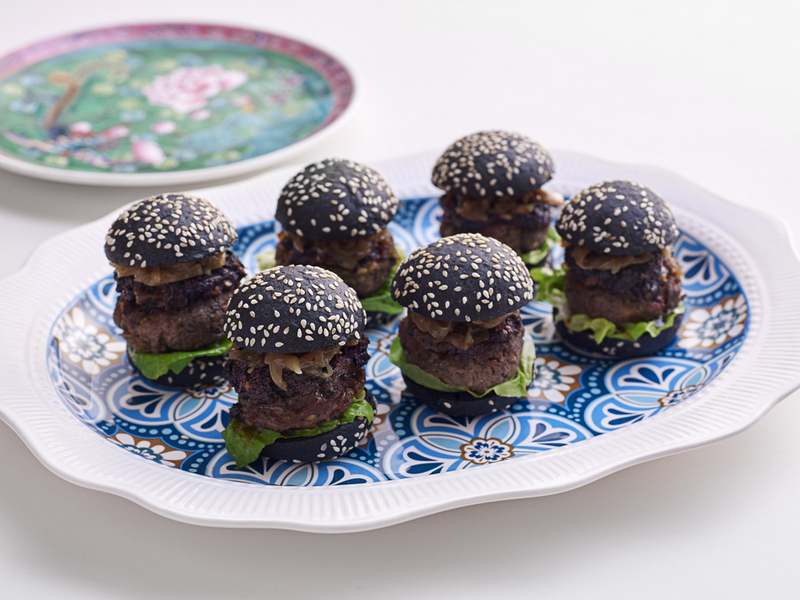 The result is the juicy, delicious patties with signature Peranakan buah keluak. The Black Gold – A Buah Keluak Beef Burger. Charcoal sesame bun is used as the vessel of the beautiful patty, topped with a generous spread of the buah keluak paste. Watch out the subtle kick of chilli at the end that will tingle your taste buds. It sure is a Black Gold Slider. Nyonya Chicken Curry Pie Tie. Pie Tie is one of the Peranakan dishes that everyone loves. Who does not like that crispy cup filled with turnip, dried shrimp, egg and nuts. I definitely do and I always have hips of this dish when available. We know that if regular Nyonya curry is used to fill the pastry, the crispy cup will not be able to hold it and it will become soggy. Nyonya Chicken Curry Pie Tie. The version here uses the same spices for making Nyonya chicken curry. However, instead of the lemak version, the recipe is tweaked into the dry version of the curry. 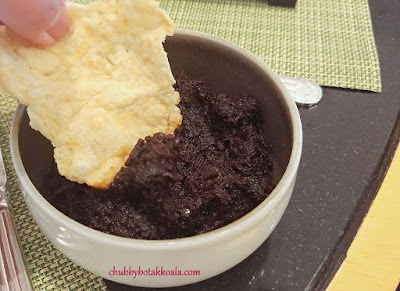 It is then loaded into the crispy cup and the result is tapas bite size of Peranakan Nyonya curry. Yummy. The following three dishes are created by Chef Alex Siah, hail from traditional Peranakan family in Melaka. Fish Otak-Otak, Passion Fruit Mayo and Black Tobiko. The surprise here is that the otah is served chilled as appetizer. The otah is moist, rich and filled the combination of spices and coconut milk. The passion fruit mayo, achar and black tobiko gave this dish contrasting texture and flavour to balance the creaminess of the otah. Fish Otak-Otak, Passion Fruit Mayo and Black Tobiko. Udang Chilli Garam, Spicy Prawn with Balsamic Vinegar and Truffle Oil. The prawn is fresh and crunchy. The spiciness level on this dish definitely on the high side. The balsamic vinegar here assuming the role of assam, while the truffle oil provided the attractive aroma that catches your attention to this dish at the beginning. Udang Chilli Garam, Spicy Prawn with Balsamic Vinegar and Truffle Oil. Bubble & Squeak with Chicken Rendang Bolognese. Inspired by this English dish, Chef Alex created the Peranakan version of this English traditional breakfast dish. 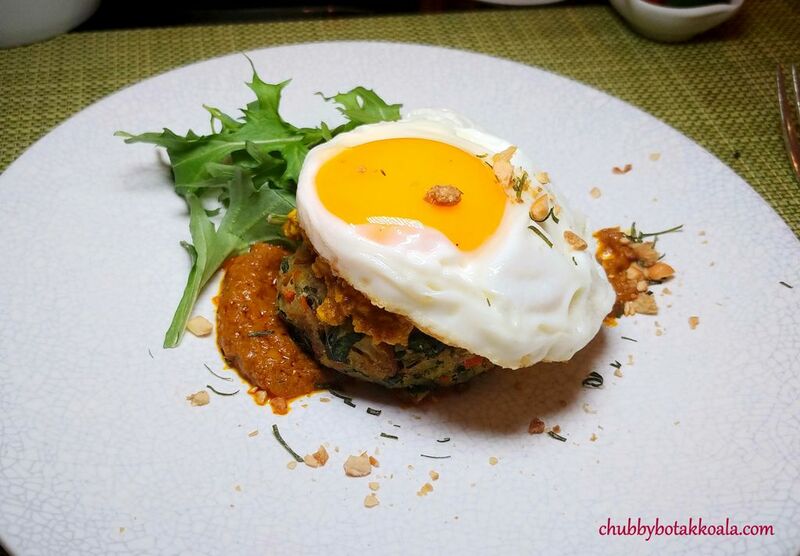 The base of this dish is potato and cabbage cake, topped with chicken rendang bolognaise and fried egg. Definitely an interesting dish. Bubble & Squeak with Chicken Rendang Bolognese. For desserts, Chef Shermay Lee created Potong Ice Cream while Chef Alex Siah served up Durian Pengat with Gula Melaka. 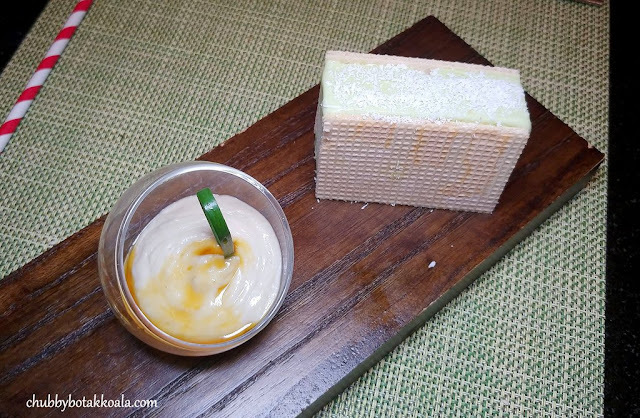 There are three flavours for the Potong Ice Cream, gula melaka, pandan and coconut. I picked gula melaka potong ice cream. It is served sandwiched between two pieces of wafers and it just brings back the memory of your childhood when you are eating it. Meanwhile the Durian Pengat with Gula Melaka is pungent, creamy, filled with durian flavour. The gula melaka syrup actually enhances the flavour of the durian further. Overall, it was definitely an enjoyable tasting experience. The dishes by Chef Shermay are homelier with international influence inspired by her version of comfort food. Meanwhile, Chef Alex dishes are edgier and inspired by local dishes from his broad overseas experience. 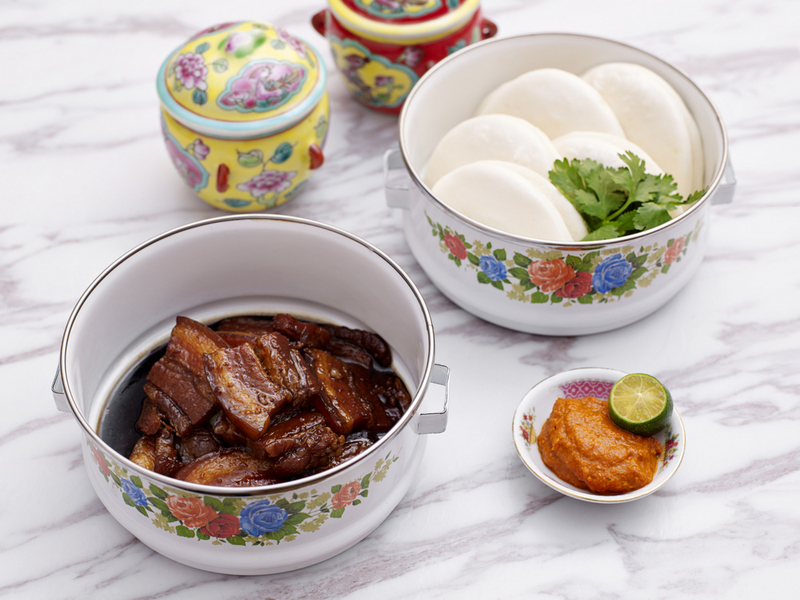 Although the style of these dishes is different, the signature and element of Peranakan Heritage remain strong on all the dishes. Come and Experience Peranakan Buffet at Oscar’s, Conrad Centennial Singapore. Cheers!! Please note that ever-popular Oscar’s buffet line up are still available.